Cook bacon. Crumble and set aside. Melt 1 tablespoon butter over medium heat in skillet. Add onion and cook until onions begin to brown. Sprinkle with ½ tablespoon brown sugar and stir into onions. Turn heat up and cook until onions begin to sizzle. Add bourbon (carefully!) to pan. This will cause the onions to bubble furiously. With caution, stir onions for about 1 minute with the bourbon cooks down and glazes the onions. Remove from heat. 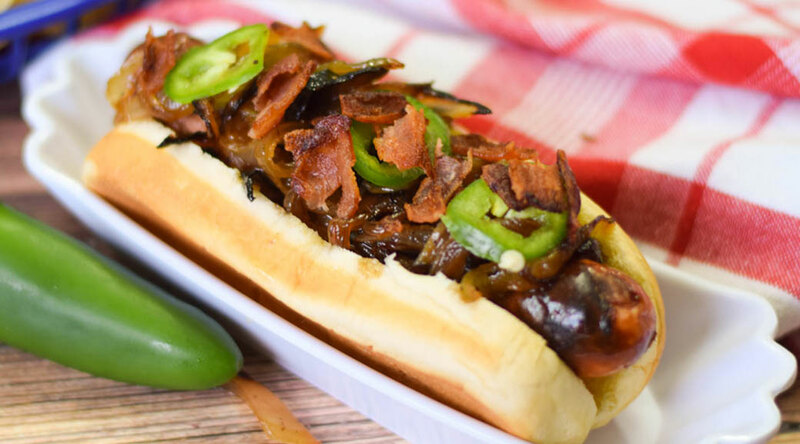 Serve onions over cooked hot dogs in buns and sprinkle with bacon.